As businesses plunge into the digital future, no asset will have a greater impact on success than data. The ability to collect, harness, analyze, protect, and manage data will determine which businesses disrupt their industries, and which are disrupted; which businesses thrive, and which disappear. But traditional storage solutions are not designed to optimally handle such a critical business asset. 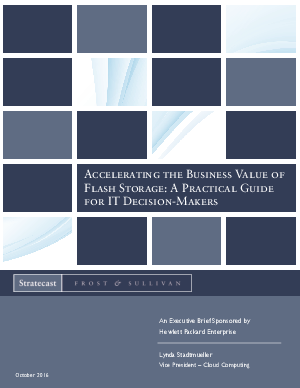 Instead, businesses need to adopt an all-flash data center. In their new role as strategic business enablers, IT leaders have the responsibility to ensure that their businesses are protected, by investing in flexible, future-proof flash storage solutions. The right flash solution can deliver on critical business needs for agility, rapid growth, speed-to-market, data protection, application performance, and cost-effectiveness—while minimizing the maintenance and administration burden.